Enrich your digital life with vivid colors! The new swivel flash drives USB 3.1 Gen 1 AH357 and USB 2.0 AH335 use stunning colors to lead the fashion trend. The 360-degree rotating cap can be uncovered within a second and will never fall off. Enjoy the convenient advantage of high speed transmission anywhere and anytime! The maximum storage capacity of AH335 and AH357 reaches up to 64GB, allowing you to carry large numbers of multimedia files to enjoy mobile entertainment. 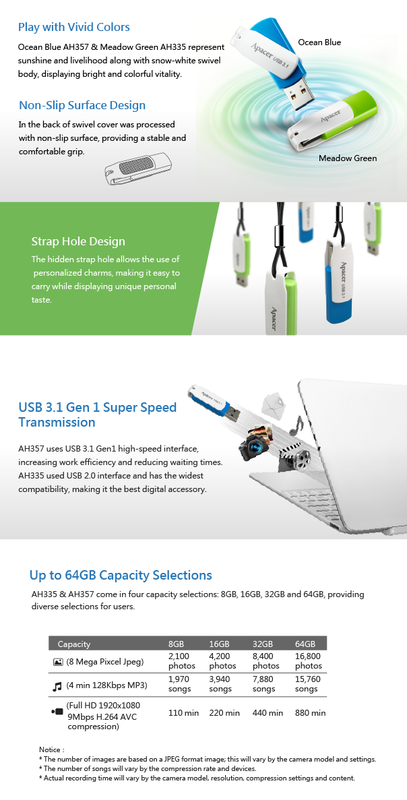 AH357 uses the newest USB 3.1 Gen1 super speed interface, able to reduce transmission time significantly and bring easier digital lives!